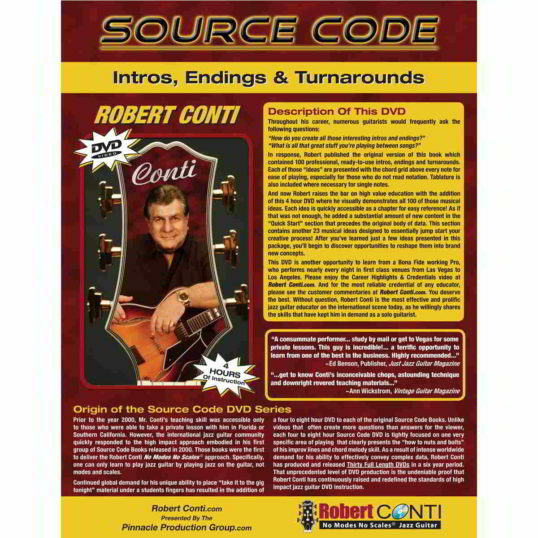 Throughout his career, numerous guitarists frequently ask Robert the following questions: “How do you create all those interesting intros and endings?” “What is all that great stuff you’re playing between songs?” This title contains a truckload of professional, ready-to-use intros, endings and turnarounds for your chord melody arrangements. In response, Robert published the original version of Intros, Endings & Turnarounds book which contained a truck load of professional, ready-to-use intros, endings and turnarounds. Each of those ideas are presented with the chord grid above every note for ease of playing, especially for those who do not read notation. Tablature is also included where necessary for single notes. 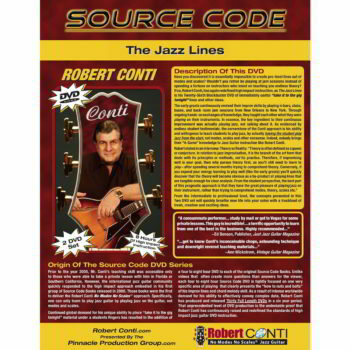 Robert raises the bar on high value education with the addition of this 4 hour DVD where he visually demonstrates all 100 of those musical ideas. Each idea is quickly accessible as a chapter on the DVD for easy reference. As if that was not enough, he added a substantial amount of new content in the “Quick Start” section that precedes the original body of data. This section contains another 23 musical ideas designed to essentially jump start your creative process! After you’ve learned just a few ideas presented in this package, you’ll begin to discover opportunities to reshape them into brand new concepts. 4 Hour DVD with each intro/ending/turnaround in its own chapter. The book Intros, Endings & Turnarounds even it works with same Formula it is very good to have 120 Ideas from an experienced musician, you can combine and create new Intros. I want to thank you. I bought the whole series of the Source Code. I learned a lot from it and still have a lot to learn. Thanks to your approach, what seemed unattainable to me, is suddenly possible. You show me the way to bring out the music that is in me, little by little. And that’s a wonderful feeling. I am learning the Endings and Turnarounds in the Source Code books and just wanted to tell Mr. Conti how much I am enjoying it. I feel like I am getting a personal lesson. After a while I forget that it is a DVD! Hello from the UK. I have just purchased the Intro’s, Turnarounds & Endings DVD and I wanted to go on record with my thanks to Robert Conti for a real eye-opener of an instructional DVD. I’m in my 60’s, have gotten all the theory books and I have learned more in a few days than in the last 5 years about the beautiful subtle chord sounds you can achieve! Robert, you are a breath of fresh air when you say, don’t go looking for your “theory godmother,” start playing first, analyze it later. Thank you again. I’d just like to thank you for doing it right! I’ve been chasing the Chord Melody style since my dad took me to hear Cal Collins here in Cincinnati over 30 years ago. I took lessons from Cal and his approach was just like yours! He wrote the arrangements on staff paper and I still play them for solo gigs. I got your Intros & Endings (Cal called them, “The Smazz” and I knew I had finally hit pay dirt! Thanks again! 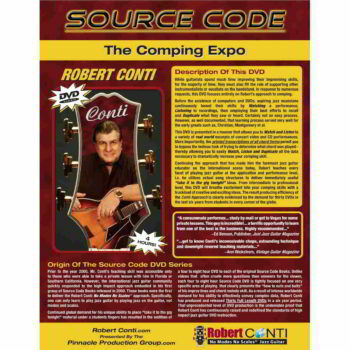 I was fortunate to be introduced to the method of playing guitar by Robert Conti. 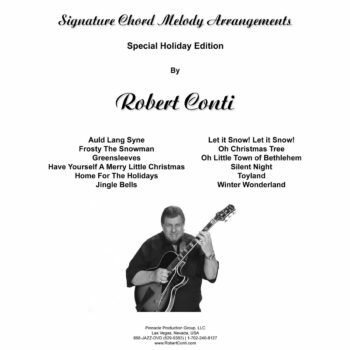 I have short fingers and worse fat ones, which are often described as sausages, however, the style and method of Robert Conti’s teaching has allowed me to play and form chords that at one time I thought impossible to achieve. I purchased “Intros, Endings & Turnarounds” and that was truly a blessing, I only wished, now that I’m 70, I had the opportunity of such a great teaching method 50 years ago.